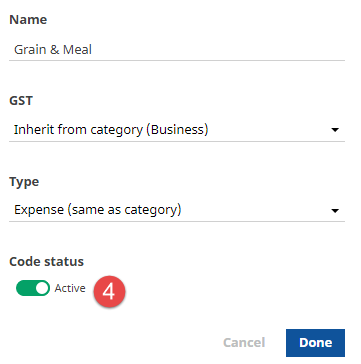 If you have used a farm code in transactions or plans, you’ll need to make it inactive which will hide it in your code list, meaning you won’t be able to select it when coding transactions or building a plan. NOTE: If you deactivate a Category that contains Extended codes, these codes will also be deactivated. Sections and Totalling areas can’t be deactivated, you will need to delete any that a no longer needed. Scroll down to the Category or Extended code you want to deactivate. Click on the vertical dots to the right of the code. Once you select Deactivate, the code will be hidden immediately so make sure you’ve selected the correct code, otherwise you will need to activate the code again. Click the code status bar at the top of the Code List page to Show inactive. Deactivated farm codes will appear greyed out in the code list. Click on the vertical dots to the right of the code you want to reactivate. Shift the Code status bar at the bottom of the code page to Active.